[128 Pages Report] The market size of Methyl Methacrylate Adhesives was USD 1.01 billion in 2017 and is projected to reach 1.56 billion by 2023, at a CAGR of 7.5% during the forecast period. Both, top-down and bottom-up approaches were used to estimate and validate the size of the MMA adhesives market, and to estimate the size of various other dependent submarkets. The research study involves the extensive use of secondary sources, directories, and databases, such as Hoovers, Bloomberg, Chemical Weekly, Factiva, ICIS, and Securities and Exchange Commission (SEC), among other government and private websites, to identify and collect information useful for a technical, market-oriented, and commercial study of the MMA adhesives market. The key players profiled in the report include Illinois Tool Works Inc. (US), Arkema (France), SCIGRIP (UK), Scott Bader (UK), Lord Corporation (US), Henkel (Germany), Permabond LLC (US), Parsons Adhesive Inc. (US), Huntsman Corporation (US), and 3M (US). 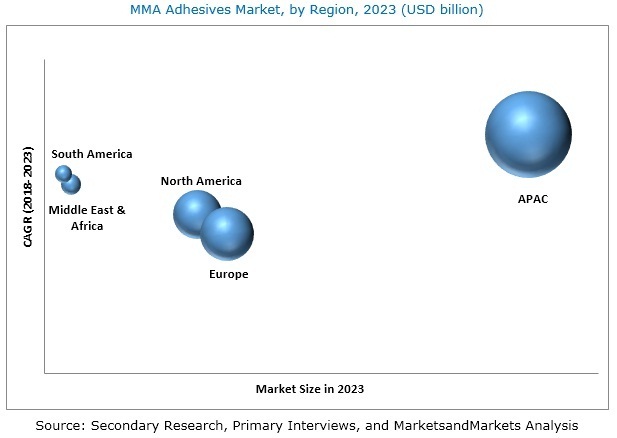 The market size of MMA adhesives is estimated at USD 1.09 billion in 2018 and is projected to reach USD 1.56 billion by 2023, at a CAGR of 7.5%. The high demand from the automotive & transportation industry in emerging countries is leading to the increasing consumption of MMA adhesives. On the basis of substrate, the MMA adhesives market has been segmented into metal, plastic, composite, and others. Metal is the largest substrate, in terms of value, and is expected to dominate the market in the future. While, the composite segment is projected to be the fastest-growing substrate in the global MMA adhesives market, in terms of value. This high growth can be attributed to the growing demand for MMA adhesives for bonding composite components, such as deflectors, bumpers, roofs, composite tanks, blades, car seats, interior body panel structures, and instrument panels of trucks, cars, rails, buses, and tanks. On the basis of end-use industry, the MMA adhesives market has been segmented into automotive & transportation, building & construction, marine, wind energy, general assembly, and others. The MMA adhesives market exhibits high growth potential owing to increased demand from the automotive & transportation and marine industries. Automotive & transportation is the largest end-use industry because of the increasing use of advanced materials for component manufacturing, which develops a need for bonding technology that can bond dissimilar materials with adjustable assembly time. MMA adhesives are used in the automotive & transportation industry for bonding components and supporting assembly functions. The use of MMA adhesives in the automotive & transportation industry is increasing as they reduce the weight of vehicles and offer excellent performance characteristics. These adhesives find application in automotive components as well as in the interiors and exteriors of automobiles. The use of adhesives has revolutionized the building and design processes in the automotive industry. In automobile manufacturing, adhesives are used for joining seats, spoilers, tailgates, side skirts, bumpers, headlights, dashboards, and others. These adhesives are also used to bond newer materials in the automotive industry such as ABS/PC, CFRP, aluminum, and coated metals. Moreover, the use of MMA adhesives is expected to increase in the future owing to the increased usage of composite materials in the aircraft and automotive manufacturing industries. The marine end-use industry includes subsegments such as motorboats, sailboats, canoes, kayaks, ski boats, and other nautical and recreational water activities. MMA adhesives gained acceptance during the mid-1990s, with wider acceptance for recreational boats, as these adhesives can bond fiberglass exterior side walls with aluminum frames. MMA adhesives offer excellent strength, minimal or low surface preparation, ease of application, and an increase in production speed. These adhesives also provide superior performance for laminated joints, reduced gel coat cracking, excellent gap filling, and remarkable open and working times according to need. MMA adhesives can be used to bond radome, radar mount, mullion, swim platform, upper deck bond, stringer, deck to hull, engine cowl, and other parts in boats. APAC is the largest MMA adhesives market as well as the major producer of MMA adhesives. The automotive end-use industry segment dominates the MMA adhesives market. APAC is increasingly becoming an important global trade and commerce center. The region is currently the fastest-growing and the largest market. With economic contraction and saturation in the European and North American markets, the demand is shifting to APAC. APAC has emerged as one of the leading producers as well as consumers of MMA adhesives due to the increasing domestic demand, rising income levels, and easy access to resources. According to OICA, APAC led the vehicle production market in 2017. The key players profiled in this report include Illinois Tool Works Inc. (US), Arkema (France), SCIGRIP (UK), Scott Bader (UK), Lord Corporation (US), Henkel (Germany), Permabond LLC (US), Parsons Adhesive Inc. (US), Huntsman Corporation (US), and 3M (US). 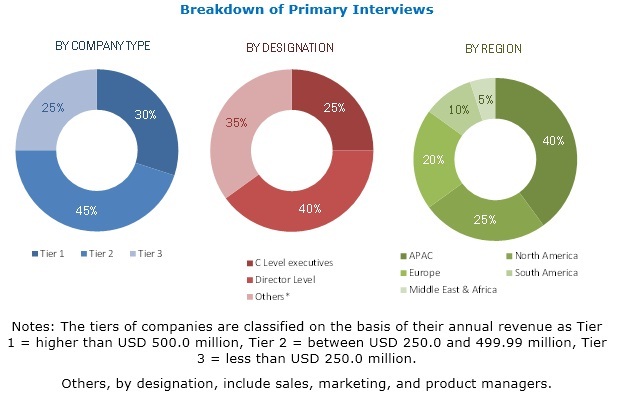 The players in this market have adopted strategies, such as investments & expansions, new product launches, mergers & acquisitions, and partnerships & agreements to expand their global presence and increase their market share. 11.1 Illinois Tool Works Inc.
11.9 Scott Bader Company Ltd.
11.11.12 Engineered Bonding Solutions, LLC.